In today’s fast paced production environment, the ability to have a high level overview and control of all released production jobs, and to monitor their status, is essential to production management and maintaining on-time delivery schedules. A Manufacturing Execution System (MES) provides the ability to plan, monitor and track all of the active jobs and machine workloads and enables managers to react on short notice to ever changing production requirements. Gaining the edge in today’s competitive market requires intelligence derived from data and the ability to act upon information to improve processes and machine performance. 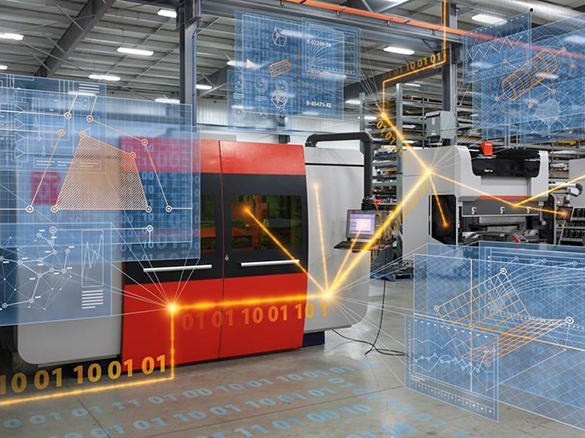 Modern CNC equipment has the ability to provide real-time data that can be used not only by automated systems but also by Smart Manufacturing software systems that provide real time intelligence for manufacturers to continuously improve their processes to gain the competitive edge. Data intelligence is providing the information necessary for manufacturers to remain efficient and profitable and also maintain quality and delivery schedules. As each job releases to production, the MES analyzes the order and identifies job requirements such as material type, thickness, and due dates, and organizes them accordingly. Based on required operations, production workflows are assigned to each job. Next, MES calculates the required times for each operation based upon known setup, cycle times, and quantities to be produced, and provides the total estimated production time from start to finish. As each job maintains an effective delivery date, this becomes the basic parameter for the planning and monitoring of the job in real-time. Real-time data from each machine provides actual runtime for comparison to target times for each job. The actual production time adjusts the job completion date in real-time and is monitored by the MES. Unscheduled delays affecting the job completion date are flagged. Declining machine performance is identified in real-time and acted upon immediately by the operator or by maintenance. Re-routing of jobs to an alternate machine are made on-the-fly to maintain optimal production schedules. Production information such as the current operation of the job within the workflow, how many parts have been produced, and the expected completion of the job are identified from within the MES. Once a job is scheduled for production, the MES identifies estimated start and finish dates and times for each operation based on machine workloads and the estimated completion date of the job. Jobs that are being pushed outside of the scheduled start and finish times due to current machine workloads are automatically identified and flagged. The MES makes allowances for flexible responses to changes in orders or priorities. Production managers can adapt orders according to changing requirements and machine workloads. Manufacturing Execution System software enables companies to plan, monitor and track all steps within the manufacturing workflow for any given order. This is made possible by the inter-connectivity of machines and the real-time data generated by each machine. The use of MES software has greatly enhanced the ability of manufacturers to dynamically respond to changes in orders, prioritization and workflow capacities in maintaining production schedules. MES software systems reduce order cycle times, increases efficiency and profitability, and contributes to customer satisfaction by managing jobs, machine resources and delivery schedules.